WHICH WILL IT BE? SACRED TRUST OR MAMMON WORSHIP? In my column last week I mentioned that in an effort to save their mango harvest from would-be scavengers some Maadiites resorted to building walls around the perimeter of their gardens. 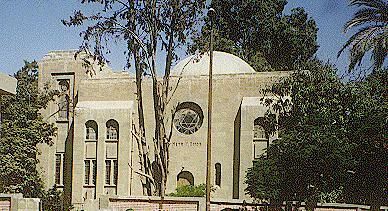 I naively stated one such protective wall was being erected around the Maadi Synagogue and its dependency. Both structures are in advanced state of neglect ever since the town's Jewish community shrunk to a one digit figure in 1967. This week I discovered the wall has little to do with mangoes and more to do with mammon. As it turns out, the reason behind the new rampart is the US$ 1.2 million real estate property it is supposed to delineate. The decision to sell this choice piece of property, now surrounded by a pink brick wall, belongs to Mr. Emile Rousseau the incumbent president of the tiny Cairo Jewish community (JCC). According to a reliable source within the community who wishes to remain anonymous, in his drive to take advantage of the overheated real estate market, Rousseau is bent on stripping the community of its assets. "His primary aim is to liquidate its holdings in both Cairo and Port Said despite alarmed protests to the contrary by his fellow board members" claims the source. "We are not sure what Rousseau intends to do with the money." One assumes the JCC president has a reasonable explanation for his recent decision and that he will elaborate on it at the next board meeting by which time the community's coffers may be brimming. Yet, as a result of his novel enterprise, Maadiites can anticipate that instead of the Synagogue's garden and caretaker cottage, they will soon have a high-rise, the kind that defies all rules of scale and proportion. Farewell also to the grand old mango trees which graced a once beautiful backyard. The synagogue's garden was one of the many achievements of Meyr Yehuda Biton, formerly Maadi's primo landscaper when the town was still run by the Delta Land & Investment Company between 1907 and 1961. Biton, whose name is inscribed high on the face of Maadi's lone Synagogue dedicated his life towards the beautification of this former garden town. He was directly responsible for the different trees that still line Maadi's avenues, streets and midans (traffic circles). Biton was also in charge of Delta Land Company's prolific apricot, prune, almond and apple orchards which occupied large chunks of Digla and the area east of Road 18 before WW-II. In 1933, Meyr Biton and his wife Regina Chamma Levi purchased from the Delta Land Company -- at a preferential rate -- the plot of land totaling 3,174 sq.m. at the intersection of Mosseri Avenue (now Orabi Street) and Road 13. Using their own funds plus those donated by Maadi's Jewish community, the Bitons commissioned engineer Isaac Kipnis, a colleague at the Delta Land Company, to build the Maadi temple which was duly inaugurated the following year. Adjacent to the temple, Biton constructed a three-story apartment building (No.14 Orabi Street) which he placed in a wakf (trust) for the benefit of his wife. After her death, the revenues from the trust would go for the upkeep and maintenance of the Synagogue.  Any left over funds were to be equally divided among local Hebraic charities such as the Goute du Lait. The Synagogue's garden included several fine fruit trees. These eventually dwarfed the caretakers stone cottage located behind the synagogue. Many old timers remember the different keepers who resided there: Enrico Nahum, Madame Rosalie and its last occupant, Madame Becky Salama, who passed away around 1990. 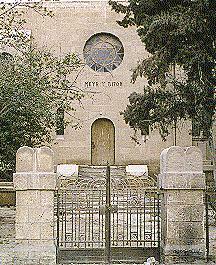 It is mostly thanks to Meyr Biton that Maadi's Jewish citizenry had a place of worship. 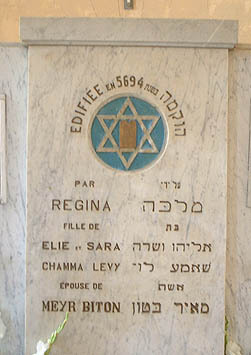 The temple's congregation included two presidents of the once thriving Cairo Jewish community. While Salvatore Cicurel of the famous Cicurel & Oreco department stores was president of the Sephardi community, Isaac Liscovitch, one of Cairo's leading jewelers, was president of the Ashkenazim and probably preferred to worship at the Ashkenazi Synagogue on Port Saiid Street in downtown Cairo. 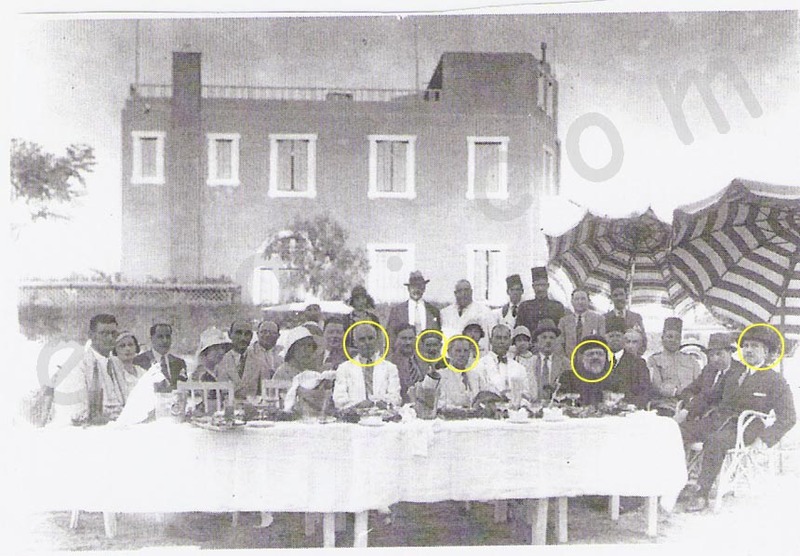 Maadi's Jews also included a pasha and several beys. As it turned out, Emanuel Mizrahi Pasha would become the last Jewish pasha in history. Less than a decade after he received his honorary title from King Farouk, Egypt became a republic where honorific titles meant nothing. Besides the titled few, Maadi boasted many prominent khawagas and businessmen from among its Egyptian and European mainstream Jews. Weddings, Bar-Mitzvahs, Purim, Hanukah, Yom Kippur, Pesach and Rosh Hashanah were routinely celebrated at the Maadi Synagogue amidst glowing lights, chants and the occasional sounding of the shofar especially during World War II. It was also during that war that all of Maadi turned up at the black draped temple for the memorial service of Micheline and Paulette Hazak, two young students at Miss Purvis School who fell victim to the typhoid epidemic. The above events, whether sad or happy, added character, color and diversity to Maadi's rich cultural life. Biton died in the 1940s knowing he rightfully earned himself a place in the celestial gardens. He had no way of predicting that international politics and much later, economics, would intervene in the disavowal of his legacy. A diligent man, he had spent his life in what was a friendly corner of the earth. Long after he died, Meyr Biton was remembered as one of the town's quainter integral landmarks. 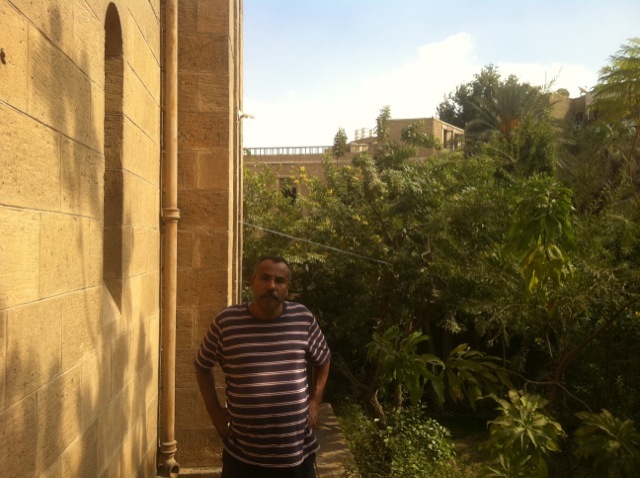 He was fondly called Khawaga Batoun by Maadi's gardeners who both feared and respected him. They knew their boss did not tolerate laziness or loitering on the job. Gardeners were therefore forever alert should Biton catch them napping as he made his endless rounds on his reliable donkey. Another telltale sign that Delta Land's landscaper was patrolling Maadi's shaded streets was the bobbing Australian bush hat with which he never seemed to part company. The hat was probably a legacy from the Australian Light Horse Brigade that had camped in Maadi during WW-1. 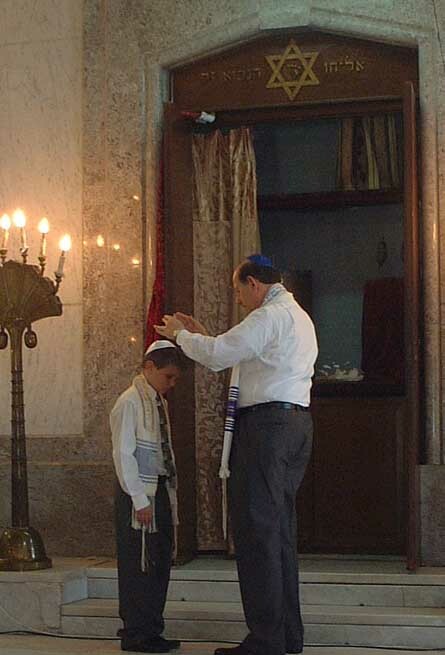 Biton Synagogue's swan song was the bar mitzvah of an Egyptian Jew, Serge A. Walberg. This was in 1962-3 when Serge was still a student at the nearby Maadi English School. 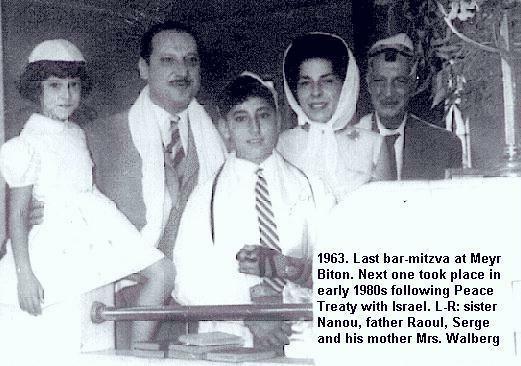 His bar mitzvah was the last one in Maadi up until 9 May 1981, when Yossi, the son of Israeli diplomat Zvi Mazel celebrated his own with Maitre Youssef Salama and US diplomat Daniel Kurtzer officiating. Today, neither the temple's expatriate worshippers, nor Maadi's citizenry for that matter know the story of the Synagogue. To them the name Biton is just an engraved inscription on the face of a quaint Maadi building. They probably ignore that this year coincides with the synagogue's 60th anniversary hence perhaps the overseas funds made available for its long overdue face-lift. But instead of the said funds going towards the remake of the synagogue, they were used to build Rousseau's brick wall. Several Israeli diplomats who elected to live in Maadi after relations were initiated fifteen years ago, also expressed their concerns. The present Israeli ambassador to Egypt, David Sultan, is an Egyptian-born Jew who spent the first 16 years of his life in Heliopolis where part of his extended family still live. Sultan knows Maadi and its Synagogue well for it was in Maadi that he resided when he arrived several years ago as a ranking member of his embassy. All who met Daoud Bey --as some Egyptian friends and neighbors call the Israeli ambassador, agree that he is an amiable and decent gentleman. It would be a real shame if the goodwill he painstakingly generated is marred should he endorse or stand indifferently by regarding the unwarranted sale of the Synagogue's garden. It is no secret that while Israel has no direct or official bearing on the JCC or on Cairo's Egyptian Jews, cultural and religious ties are nevertheless there. Egypt is well aware how members of the Judaic faith cherish their history and heritage regardless of time and space. Surely this characteristic trait cannot ignore an endowment created by a coreligionist only six decades ago! Or does mammon worship have precedence over everything? If nothing else, Meyr Biton must be turning in his grave. L-R: Nanou with father Alfred Walberg (Valberg), brother Serge, mother Giselle and an uncle. I was known in Maadi as Poucette Riso-Levi, but since I am pushing 60, I have to go by my official first name (Isabelle ). I changed my last name (Riso-Levi) in the US as it was too complicated to have to spell every time. Now I say my name is Levi, like the jeans, and everyone knows how to spell it. I have visited all the sites on Maadi yesterday and read your book on Maadi. Here is the latest news on the Valbergs: Mr. Valberg (whom we knew as Alfred) passed away recently (1-2 years ago) and his wife, Giselle is in a protestant(?) retirement home in Montpellier. Nanou is in Montpellier, along with her son Sam who is between 12-15 years old. Chico (Serge) has moved to Australia, where he works with computers and is a "tombeur de coeurs" (ie ladies go for his nice looks). I went to the Lycee francais of Maadi until 1955, and afterwards to Lycee el Horreya (ex francais) of Cairo until 1961 when I graduated, and then to AUC - 1961-1966, and then I left Egypt for the US, while the rest of my family settled in France. I wrote a poem in Arabic (the only one in Arabic) describing the wrenching experience of leaving Egypt. don't have access to the Arabic script on this computer, so if you give me your address then I could send it to you. sign our guestbook or send your feedback to Bassatine News and read what others wrote during the last 10 years!